A group of Brexit supporters put up a load of Union flags in Parliament Square, getting up at 6am to do so. The area is popular with Remain campaigners, with EU flags being spotted in the background of news broadcasts for the past few months. However, this morning (March 28) a group of four people descended onto the square to place 34 Union flags along the fences. 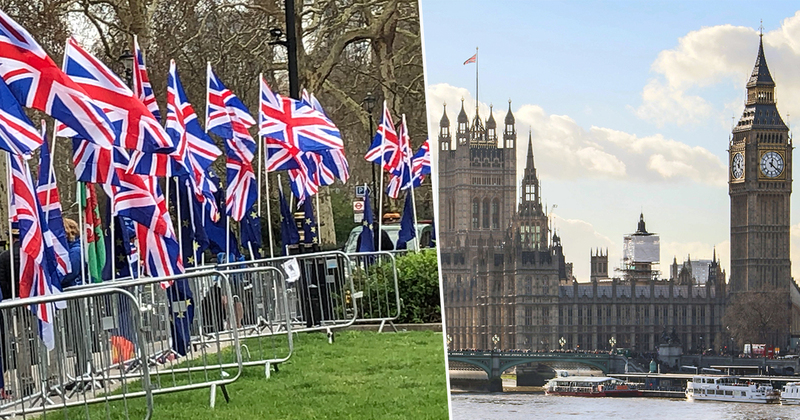 As reported by the Metro, David Ireland, 41, and three others arrived at the square at 6am this morning with their custom made flags – to make sure they got there before anyone else. People turn on the TV and see this entire wall covered in EU flags, some people want to be in the EU but there’s also some people who don’t want to be in the EU, so we’ve come along and done our flags. What the Remain voters do is shun all the Leave campaigners into the irrelevant middle ground and dominate the TV space. The narrative was this is the EU zone, we own this, but it seemed a little bit one-sided. As predicted, a ‘flag war’ ensued as the Remain campaigners arrived at 7.30am and began placing their flags around those placed there by Ireland and his group. It seems as though the flag war will be short-lived though, as Ireland hasn’t committed to doing the same thing again tomorrow. Asked if he was going to come back, he replied: ‘I’ve got a job, I can’t do this all the time like they do’. Right then. All of this comes after MPs last night (March 27) voted on eight alternative options to May’s proposed deal, chosen by the Speaker of the House. Leave the EU with no deal on April 12. EEA/ EFTA (without a customs union). Leave the EU with a UK-wide customs union. Permanent customs union, including alignment with single market on future EU rights and regulations. Revoke Article 50 if no-deal Brexit is not explicitly approved by MPs a day before we are due to leave. Any Brexit deal must be put to the public in a ‘confirmatory’ second referendum. If no withdrawal agreement agreed, seek ‘standstill’ agreement with the EU while negotiating trade deal aka the ‘Malthouse Compromise Plan B’. None of the proposals earned a majority of parliamentary support, and the country is no closer to understanding what the hell is going on with Brexit.